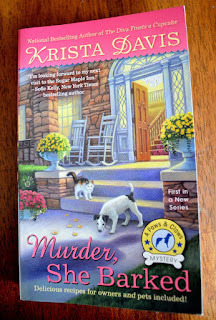 I’m never happier than when I find a new mystery series to read, especially if recipes are included. 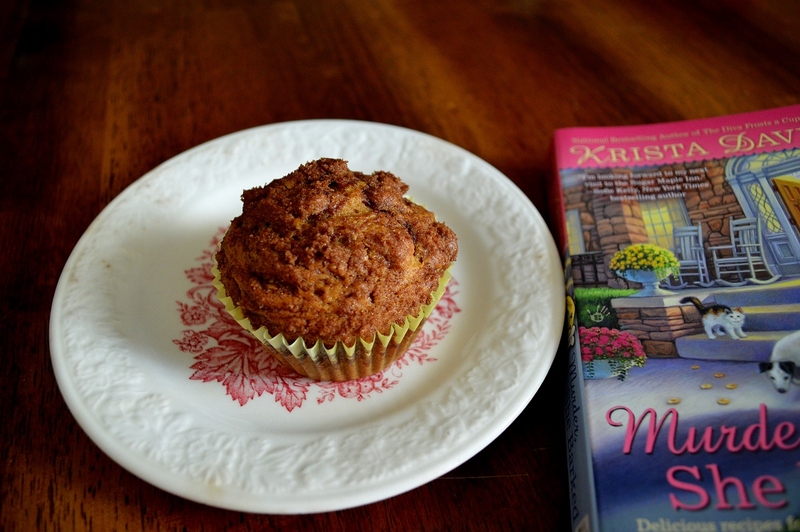 Krista Davis’s Domestic Diva series is one of my favorites, and I’ve shared a couple of recipes in the past from her books. So it made sense to try her Paws and Claws series. I read the first chapter of Murder, She Barked while standing in the bookstore! This series is set in the town of Wagtail, Virginia, which as the name suggests, is a very pet-friendly place. Holly Miller’s grandmother owns the Sugar Maple Inn, where guests and their pets are welcomed. Add a few unique characters, plus a murder or two, and you’re in for a fun visit. As with Davis’s other series, this one offers lots of recipes at the book's end. For pet owners, there are recipes specifically for our furry friends. 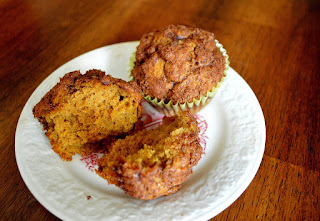 With it being autumn, I gravitated towards this people-friendly Cinnamon-Pumpkin Muffin recipe. My favorite flavor and a fall flavor classic mixed together. How could I go wrong? 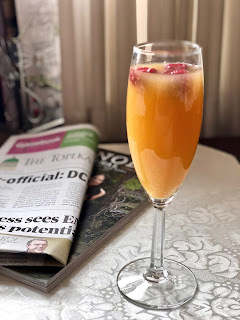 The recipe is easy to mix up and tastes amazing! I enjoyed it with both my morning coffee and afternoon tea, and I think it would make a nice Thanksgiving breakfast. Now I'm off to get book 2 in the series. Preheat the oven to 350 degrees F. Line a muffin tin with paper cupcake cups. Set aside. In a large bowl, whisk together the flour, baking powder, baking soda, salt and 1 teaspoon cinnamon. Set aside. In a small bowl, whisk together the eggs, vegetable oil, 1/2 cup dark brown sugar, granulated sugar, and pumpkin until well blended. Pour the mixture into the flour mixture and stir until just blended. Be sure to not overmix. In a small bowl, mix together the topping ingredients. Spoon the muffin batter into the muffin tin until the cups are almost full. Sprinkle a teaspoon of the topping mixture on top of each muffin cup. Using a toothpick or a bamboo skewer, swirl the topping into the top of the muffin. Place the muffin tin into the oven and bake for 15 to 20 minutes, or until a toothpick inserted into a muffin comes out clean.